On the 20th and 21st of May Lama Jampa taught at Karma Migyur Ling, France. Situated on the edge of the French Alps and on the top of a hill with far reaching views, Lama Jampa described this Buddhist centre as like finding a jewel in a beautiful place. Even more precious, Lama Jampa said, is Lama Teunsang who resides permanently at Karma Migyur Ling and founded the centre over 40 years ago after being directly instructed to do so by His Holiness the 16th Karmapa. Over the course of the weekend Lama Jampa gave a detailed explanation of the famous prayer called The Short Prayer to Vajradhara. This prayer was composed by Pengkar Jampal Zangpo, a 15th century master and disciple of the sixth Karmapa. The prayer serves the two-fold purpose of invoking the blessings of the glorious Kagyu lineage while also setting out the stages of realisation of the Mahamudra. It can be recited alone but it also forms part of the guru yoga in the Kagyu ngondro. Lama Jampa described the visualisation to the practice according to instructions given by the great Kagyu master Karma Chagmed, while instructions for the stages of the path were according to teachings Lama Jampa received from his own lamas, especially from Karma Thinley Rinpoche, based on teachings of the 3rd and 9th Karmapas. 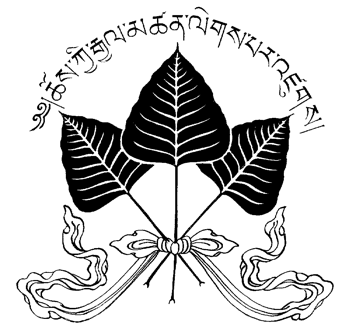 The verses describing the stages of the path take us through the outer preliminaries, which are the four thoughts that turn the mind to dharma; the inner preliminaries or ngondro; the stages of shamatha and vipashana according to the Mahamudra teachings; and finally the aspiration to attain the level of Vajradhara Buddha himself who is none other than the dharmakaya. At the end of the weekend Lama Jampa expressed his thanks to the Sangha of Karma Migyur Ling for their kindness and for being a source of inspiration by showing authentic Kagyu Dharma being transmitted in a pure and unhindered way in France. Lama Jampa prayed for Lama Teunsang’s long life and continued Dharma activity and wished every one at Karma Migyur Ling a great summer with the visit of His Holiness Karmapa Thinley Thaye Dorje in August. The sangha of Karma Migyur Ling extended their wishes that Lama Jampa return to teach again.